Elsie Garber submitted this photo and caption. My son, Stephan began his DCI career the summer of 2006 with the Glassmen. He marched with them for two years and decided to spread his wings. 2008 was the year of "Spartacus" and Stephan was performing in the contra section of Phantom Regiment. It still gives me tingles just thinking about that evening in Bloomington. Never one to let too much grass (is always greener) grow under his feet, my fourth-year music ed major jumped the fence and aged out with Carolina Crown for his "Second Chance." 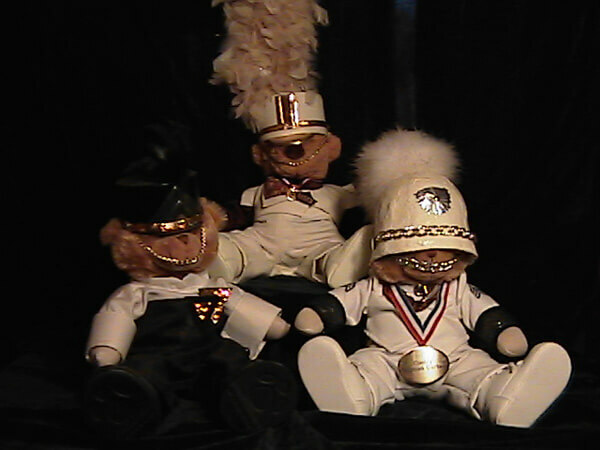 To commemorate his accomplishments I created these bears during their respective summers while Stephan toured the country (and Europe) with some of the greatest people on earth ... DCI corps, members, parents, and fans. The uniforms came easy, but needless to say, the headgear was a "bear" to make. They will one day be displayed in the home he makes after graduation from Wright State as he continues his musical journey.